If you are unable to answer your emails, for example, because you are on vacation, it is a good idea to set up an out-of-office reply. That way, people are aware that you might not answer right away. A good out-of-office reply lets people know that you are not available when you are expected to be back and who to contact instead. You can also use an auto-reply to send a confirmation that an email has been received. Log in to Webmail and click Settings. Click on Account administration in the menu to the left and scroll down. Check the box to enable auto-reply. Enter a subject for your auto-reply. Type in a message for your auto-reply. 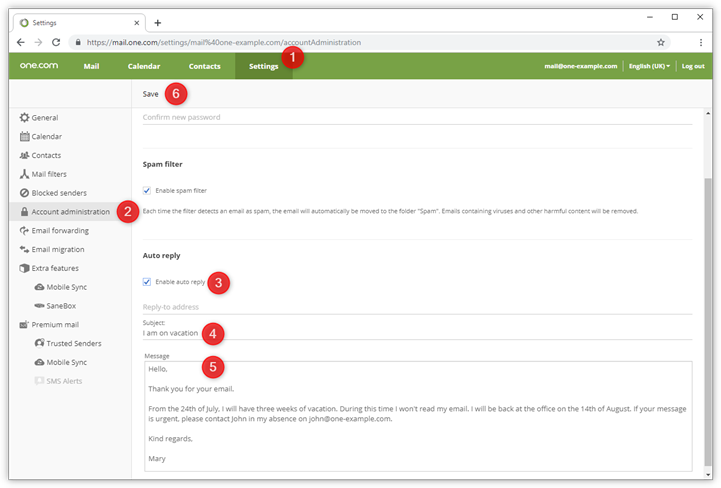 You can also set up an auto-reply from Mail Administration in the control panel, where you can manage all email accounts on your domain. Note: If you want to test whether your out-of-office is working, you need to use a different email address than the one you just enabled auto-reply for. What should you enter for the reply-to address? Additionally, you can specify a reply-to address when you set up the auto-reply message. You can also leave it empty. If you do enter a reply-to address and someone responds to your vacation message, the email will be sent to that address. This can be useful if you want people to contact someone else, or write to an alternative address. Tip: Remember to disable your auto reply message again when it's no longer needed.